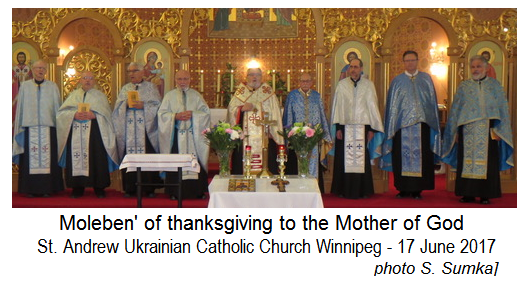 The beautifully decorated church of St. Andrew the Apostle Ukrainian Catholic Parish in Winnipeg’s Point Douglas area was the site of a prayer evening of thanksgiving for the 50 years that Redemptorist Father Len Ratushniak has been serving the People of God as an ordained priest. On June 17, 2017, the Archbishop of Winnipeg, His Grace, Metropolitan Lawrence Huculak, lead a Moleben’ to the Mother of God. A number of priests joined in the concelebration, but Bishop Michael Wiwchar, CSsR and Fr. Len were invited to stand at the Altar with the Metropolitan. Aside from the clergy, the congregation included a group of Sisters Servants and many lay-Faithful that have come to know Father Len over the years. In his sermon, the Archbishop noted the large crowd that had gathered and made the comparison of how a similarly-sized crowd was at Fr. Len’s ordination 50 years ago. He spoke of how the life and mission of the priest is such that he serves the people and the people in turn receive that ministry and respond with their support. It is a mutually beneficial relationship as the Will of the Lord is fulfilled for His Church over the years. St. Andrew’s was the natural place for the celebration as Fr. Len presently serves as the Pastor of this inner-city parish. After the Moleben’, the crowd made its way to the parish hall of the neighbouring Roman Catholic Portuguese Parish of the Immaculate Conception. The facility was chosen as it would be large enough to hold the anniversary banquet. After everyone had found their way to their designated table, the Master of Ceremonies for the evening, Jerry Semerak, called upon His Grace, Metropolitan Lawrence to give a blessing. St. Andrew’s Parish Council presented Fr. Len with a bouquet of flowers and the testimonial dinner soon got underway. A seemingly limitless supply of merlot cabernet and chardonnay – wines specially crafted and bottled for the occasion – were served throughout the evening for the reception and during the meal. The wonderful meal was provided by Ludwick’s Catering. Throughout the evening a fascinating slide presentation of scenes from the life of Fr. Ratushniak was projected on screens in the banquet hall. When everyone had eaten a Mr. Semerak began the program by reading a few messages from individuals who were unable to attend. Then a series of greetings were given. On behalf of St. Andrew’s Parish, Dayna Konopelny conveyed the gratitude and best wishes that the parishioners wanted to express to their Parish Priest. She said that although Father Len’s life took him to many various parishes and pastoral experiences, they felt blessed that he was now their priest. MaryAnn Klasz brought greetings from the parish branch of the Ukrainian Catholic Women’s League of Canada. A tribute from the Sisters Servants of Mary Immaculate was expressed by Sr. Darlene Pelechaty. On behalf of Fr. Len’s religious community of the Congregation if the Most Holy Redeemer, Redemptorist Provincial Superior Fr. 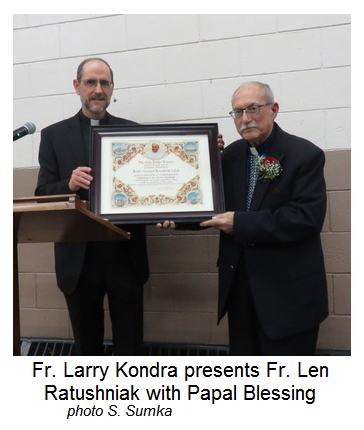 Larry Kondra spoke of the jubilarian’s life and ministry. He made a humorous comparison of a possible conversation between Fr. Len and confrere Fr. Frank Szadiak and the two elderly men Statler and Waldorf in the balcony of the once popular Muppet Show. Finally, Fr. Len spoke and, surprisingly, rather briefly. In his comments, he spoke of why he requested that a Moleben’ to the Mother of God be the prayer of the occasion. He explained that it is by Mary’s continuous intercession throughout his life that he enjoyed any and every success is his half century of priestly service (and even prior to that). His mother had an image of the icon of Our Mother of Perpetual Help in her home where Fr. Len would pray together with her as a child. When they moved to Yorkton and attended the local Ukrainian parish, the church had a large icon of Our Lady of Perpetual Help behind the altar. When he finally decided to join the Redemptorist Fathers, there again, naturally, he encountered not a few images of the same miraculous icon and always felt at home. Among a few stories, he told one of the discernment of his vocation. His superior asked him to spend time in prayer and reflection and to determine if he truly had a vocation to the religious (monastic) life and to the priesthood. He spent considerable time praying in the chapel. However, the Lord did grant him the conviction in his soul that he truly did have a calling (vocation) to this extraordinary life of service to God and His People. He never looked back and never felt a need to question that discernment. He has served the Church faithfully ever since to this day. May the Lord richly reward Fr. Len for his years of service and continue to bless him with more years of health, peace and dedication.